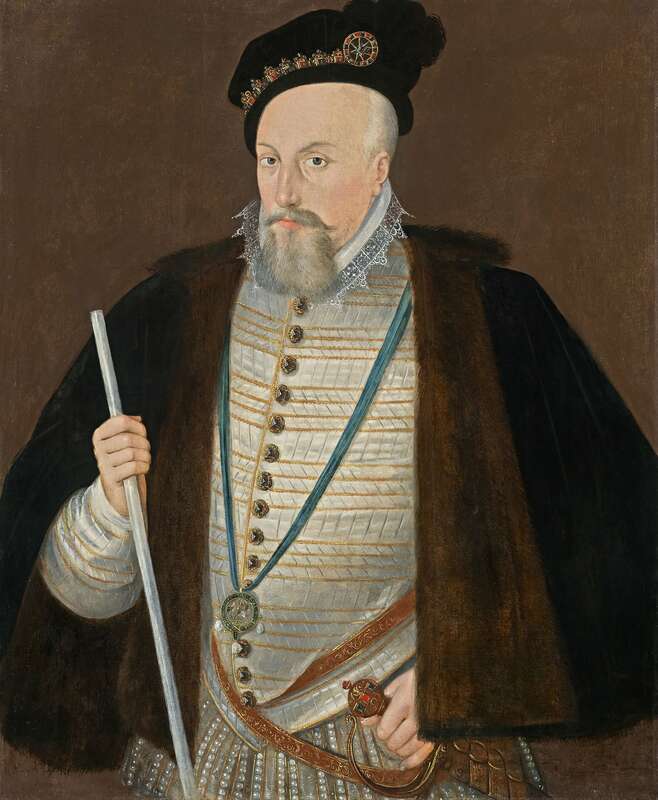 This striking portrait of one of Elizabeth I’s most trusted and daring courtiers, Robert Dudley, derives from the prime three-quarter-length portrait of the sitter by William Segar (Private collection, previously of the famed Baron Lumley collection), thought to be the last ad vivum portrait of the Earl. A proud and successful figure in Elizabethan politics and court life, the 1st Earl of Leicester was, after the Queen, the most regularly depicted figure of his time. The number of portraits which survive reflect Leicester’s political importance and his boundless preoccupation with the propagation of his own image. Several other versions of the Segar portrait exist, ranging from bust to three-quarter-length, and can be seen at Hatfield House; Warwick Castle; Parham Park; Corpus Christi College, Cambridge; University College, Oxford; Penshurst and Knole. Ours is closest to that in the Marquis of Salisbury’s collection at Hatfield House. Catalogued as by Federico Zucchero: “Earl of Leicester, Robert Dudley, Favorite of Queen Elizabeth. Zucchero. Panel, 35 inches by 28; in a black cloak, trimmed with fur, a white satin waistcoat, collar of the order of the garter, hat and jewel &c. 18l. A very interesting portrait, and, except in the ornaments of the waistcoat, precisely like the picture of this Earl in the possession of the Marquis of Salisbury, at Hatfield.” Sold for £18. The type can be dated to c. 1587, after Leicester’s return to England from the United Provinces. In 1585, Elizabeth had entrusted him with the English army to assist the United Provinces in their struggle with Spain, but he showed such incompetence and so angered the Queen by his own adoption of the title ‘Governor of the Netherlands’ that he was recalled in 1587. Nonetheless, he was sufficiently in favour that only a year later, during the Armada crisis, Elizabeth appointed him Commander-in-Chief of the troops at Tilbury to oppose the Spanish invasion. He died suddenly in the same year, with some suspicion of poison. Here the Earl of Leicester can be seen holding the white lord steward’s staff (stave) in his right hand whilst his left hand grips the handle of his sword. Although Leicester was appointed the Lord Stewardship in 1584, it was only recognised on his return to England in 1587, thus providing a terminus post quem for the portrait. A slight variation from the prime portrait, around his neck we see a long blue ribbon with the Order of the Garter of St George. His white satin doublet is embroidered with gold thread and punctured with black studded buttons. His large black velvet robe is lined with fur, possibly a souvenir from his time in the United Provinces. Robert was the second son of John Dudley, Duke of Northumberland and Protector of England during the reign of Edward VI. His father was executed for his part in the cause of Lady Jane Grey and the Wyatt insurrection. Dudley was tried on the same account but pleaded guilty and was imprisoned – though his life was spared. With the accession of Queen Elizabeth, Dudley’s fortunes rose. He was given a position in the Queen’s household as Master of the Horse, and was soon touted as a royal suitor. By 1561, with the death of his wife (in mysterious circumstances), he had become consort apparent. However, the marriage was never to happen and instead Leicester became, as a counter-weight to Lord Burghley, one of Elizabeth’s two most important members of Council. He was further rewarded with appointments as Knight of the Garter, Privy Councillor, High Steward of the University of Cambridge; then in 1546, Elizabeth created him the first Earl of Leicester. Having finally given up hope of marriage to the Queen, in 1578 he secretly married Lettice Knollys, the widow of Walter Devereux, 1st Earl of Essex; an act which resulted in Elizabeth’s furious displeasure. William Segar was a man of numerous talents; initially admitted to practice law at Gray’s Inn in 1579, his career took a slightly different path when he was introduced by Sir Thomas Heneage to the College of Arms and plausibly to Leicester. Here Segar would rise through the ranks, from Portcullis Pursuivant in 1585 to Norroy King of Arms in 1593 – apparently endorsed by Robert Dudley. It is surprising to consider that Segar was not far into his service at the College of Arms when Dudley requested that he join him in the Netherlands to serve as the Master of the Ceremonies in the earl’s St George’s Day festivities held in Utrecht in April 1586. Dudley had already employed him as early as April 1584, and it would seem likely that Leicester also wanted a capable portraitist to paint him at the height of his achievements. As Norroy, Segar carried the Sword of State in the funeral procession of Elizabeth I in 1603, and that same year he was made deputy Garter. He obtained a great seal patent confirming him as Garter in January 1607, was granted arms in 1612, and knighted on 5 November 1616 for his services in heraldry. That same year, his colleague and rival Ralph Brooke – York Herald – tricked Segar into granting a commoner arms so that he could masquerade around the continent as an English gentleman. Brooke reported this misdemeanour to James VI & I who then ordered the imprisonment of both Segar and his whistle-blower. They were released after only a few days on the assumption that both had learnt their lessons; Brooke to be more honest and Segar to be more wise. As well as being a painter and a man of noble office and importance, Segar published poems and writings that expressed his Protestant leanings. In terms of his artistic talents, he was contemporaneously regarded as one of the leading portraitists in England. According to an old photograph of the present painting held at the National Portrait Gallery’s Heinz library, there was once an inscription charged to the top left of the panel misidentifying the sitter as Charles Brandon, Duke of Suffolk and misdating the painting to 1520. E. Goldring, Robert Dudley Earl of Leicester and the World of Elizabethan Art, London 2014. p.144.